Indian fishermen will not go ahead with a proposed protest in Kachchativu today, following last minute talks Sri Lankan fisher leaders held with their Tamil Nadu counterparts, the Sunday Times learns. Indo-Lanka Fishermen’s Welfare Forum Advisor S.P. Anthonymuttu told the Sunday Times he urged Rameshwaram Mechanical Fisheries Craft Association President N. Devadas not to use a religious ceremony for political issues. Tension was building after a week-long protest in Tamil Nadu by fishermen who demanded that the Indian government intervene to obtain the release of ten Indian fishermen and 79 boats in Sri Lanka’s custody. Mr. Anthonymuttu said he received information that the Indian fishermen coming for the St. Anthony’s feast in the 1.15 sq. km island off the west coast of the Jaffna peninsula were planning to hold a protest after today’s main mass to demand the release of their colleagues and the boats. “They have given us an assurance that they will not hold the protest. I hope they will keep their promise,” he said. Indian media reports said the fishermen would stage a protest outside Sri Lanka’s Deputy High Commissioner’s office on February 29. Some 3,200 Indian pilgrims have been granted permission to visit the island, though 3,477 people had applied. The Indians began to arrive in Kachchativu last afternoon in keeping with a 1974 agreement, according to which India recognised Sri Lanka’s ownership of the island. They were welcomed by the Sri Lanka Navy, which has been entrusted with the task of looking after the pilgrims’ welfare. 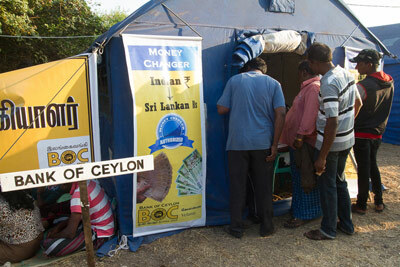 The Bank of Ceylon yesterday opened a facility there to enable the visiting Indian pilgrims to obtain Sri Lankan currency as many of them buy clothes, footwear, fancy goods and other items at stalls run by Sri Lankan traders. Jaffna’s Deputy Inspector General G.K. Perera said 150 policemen had been deployed on duty in the island.